From celebrating with Mikhail Baryshnikov to tracking down Anna Netrebko to tracing the rise and fall of Soviet hockey star Slava Fetisov, the next two weeks are full of cultural events for every kind of fan. Friday, Jan. 23, is a special day for all hockey fans. Today the documentary film “Red Army,” directed by Gabe Polsky, goes into limited release. Told from the perspective of Slava Fetisov, former captain of the Soviet Union’s hockey team, the movie traces his transformation from national hero to political enemy. It’s well known that during the Soviet era, sports – and hockey in particular – played an important role in the propaganda machine. Hockey players were supposed to inspire millions of Soviet citizens and show how the Communist system could triumph over the Capitalist West. To find out more about how the Cold War played out on the ice rink, check out the latest listings here. The film opens in New York and L.A. today, in San Francisco and Washington, DC on Jan. 30, and nationwide in February and March. On Jan. 27th Russian-American dancer, choreographer, and actor Mikhail Baryshnikov will celebrate his 67 birthday. While RBTH doesn’t have any information about where he will hold his party, we do recommend that you visit the Baryshnikov Arts Center in New York, where you can see some amazing performances. The foundation and arts complex celebrates its 10th anniversary this year. For more information and the latest schedule of events, visit their website. He made his film debut, however, in 1985’s “White Nights.” This drama directed by Taylor Hackford and choreographed by Twyla Tharp also stars Gregory Hines, Jerzy Skolimowski, Helen Mirren and Isabella Rossellini. The plot closely resembles Baryshnikov’s life, particularly his defection from the Soviet Union in 1974. For those who like comedies and Baryshnikov, Dmitry Povolotsky’s 2011 film “My Dad Baryshnikov” is the perfect choice. It tells the story of 14-year-old ballet dancer Borya Fishkin, whose puberty coincides with the tumult of perestroika. In hopes of being accepted in the cutthroat subculture of ballet, Borya creates the fanciful story that he is the son of Mikhail Baryshnikov. On Jan. 30, the Silver Archer-USA awards, which recognize the most successful projects working to further intergovernmental, cultural, economic and social ties between Russia and the U.S., will be presented for the fourth time. The ceremony will take place at the Trade Representation of the Russian Federation in the United States. It is open to the public, but visitors should RSVP by Thurs., Jan. 29. For more information, visit the website. From Jan. 14 to Feb. 14, St. Petersburg’s world-famous Mariinsky Theater will be touring the U.S. Interested in seeing them? Check the theater website to see if there are any tickets left. As a part of the tour, Valery Gergiev will conduct the opera Iolanta/Bluebeard’s Castle at the Metropolitan Opera six times, beginning Jan. 26. Soprano Anna Netrebko will play the role of Iolanta. Thanks to the program Met Live in HD, audiences around the U.S. will be able to watch their final performance at movie theaters on Feb. 14. Netrebko fans in New York have a chance to see the diva up close and raise money for charity at the same time by attending the Petroushka Ball, which is celebrating it’s 50th anniversary this year on Feb. 6. 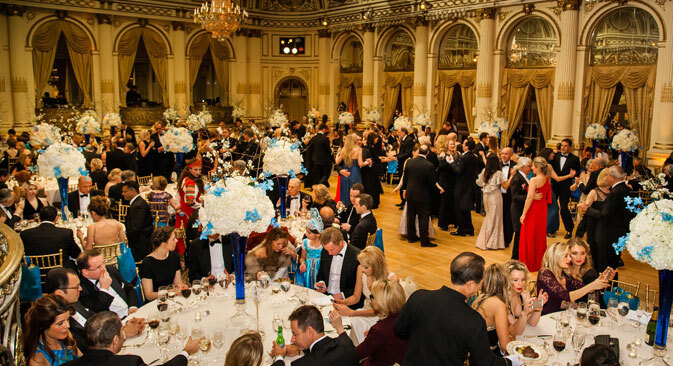 Since its inception in 1965, the Ball has been one of New York's most vibrant and elegant Russian-American events. This year’s event will feature a performance by Netrebko and Polish operatic tenor Piotr Beczala. All net proceeds from the 50th Petroushka Ball are directed towards the charitable programs of the Russian Children’s Welfare Fund. Some of the programs the organization supports are: scholarships for orphans, medical treatment for children with severe facial deformities, rehabilitation programs for children with special needs, and a holiday party in Moscow for over 1,000 disadvantaged children from across Russia. To learn more about the event, which includes dinner and dancing along with the musical performances, and to buy tickets, visit the website.